If you’ve read chapter 2 of The Big Switch by Nick Carr, you’ll know some of what I’m talking about here. That chapter is all about Thomas Edison and the electrical inventions he led, as well as the battles he fought over the business side of electricity, and so much more. I thought I knew something about Edison until I read that chapter, and now I’m left wondering … why has there never been a major movie telling this story? As the story in Carr’s book goes, Edison was inspired by a trip through the Rockies — on seeing the Platte River he thought there should be a way to use electricity to harness the river’s power. Edison became focused on how to produce large quantities of electricity, how to transmit it safely into the home/office, how to make it usable for lighting, how to measure the amount of electrical use (for billing purposes), and how to make money doing all this. Within two years, he and his team had developed a new type of lightbulb, blueprints for a central generating station, and a way to get the power from the station into the building to power the lightbulb. He formed the Edison Electric Company to license this system, then formed other companies to sell the products and material needed to make it happen. But Edison’s system was built to serve very small footprints — a square mile or so for each generating station. His system was good for residential areas and small businesses. But large industrial companies bought their own electrical systems to run factories — they didn’t rely on getting power from the electric company (Edison). Edison stuck with his direct current electrical system (DC), even though it was limited in reach. Nikola Tesla developed the alternating current system (AC) which had far greater reach. When the public started to realize the benefits of AC, Edison started a propaganda war to try to convince Americans that AC was too dangerous. If you read the Wikipedia entry about this, there’s even talk of Edison employees electrocuting animals in public to show the dangers of AC! Holy $#!@#$. Tesla worked for Edison at one point, but Edison apparently reneged on a promise to pay Tesla $50,000 for help in improving Edison’s DC generating stations. When Tesla came to collect, Edison called it an “American joke.” Ouch. 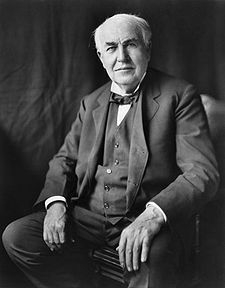 Anyway, Edison had a hand in inventing or improving the telephone, telegraph, the light bulb, the stock ticker, motion picture camera, and hundreds more inventions. He has more than a thousand patents in his name. A thousand! And, as explained in Carr’s book and even the Wikipedia entry, there’s all kinds of intrigue and compelling storylines in how all of this happened. So, I ask again, how come there’s never been a major Hollywood movie made about his amazing story?